What’s more kid friendly than a cooking project that doubles as dinner? In my book, nothing. 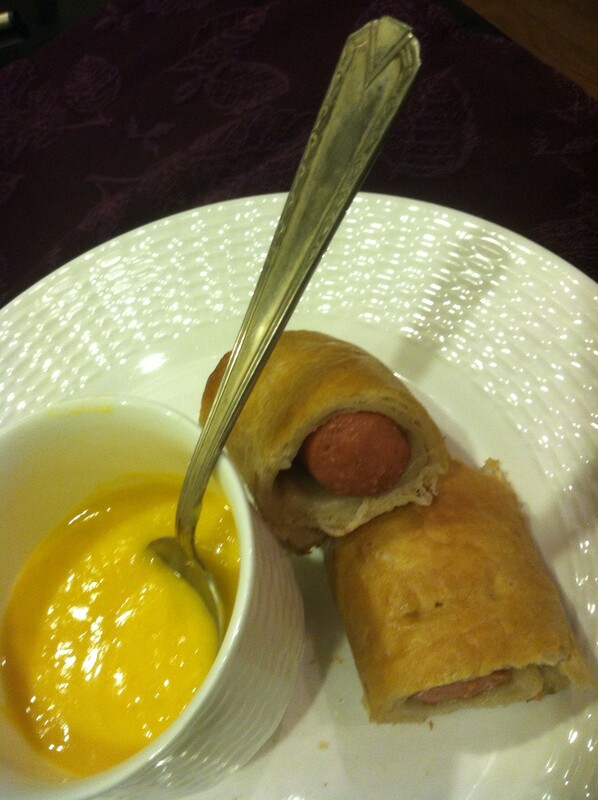 Tonight we had pretzel dogs with coconut squash soup. The mix of the sweet soup with the salty dog was divine enough to keep my taste buds happy while also providing that added mix of comfort. Comfort food – yay! Creating this perfectly simple dinner is even more fun when you hit rewind. It all started with making the pretzel dough. (Sorry friends, yes, I am still obsessing about pretzels). B and CJ were involved from this point on. The ingredients are few and simple. The process provides short bursts at a time that are perfect for the attention span of my active brutes. There is activating the yeast. Pouring, stirring and waiting for bubbles. Each part captivating for young chefs. Next there is creating the dough. Followed by kneading. Then, letting the dough rise. Followed by shaping. If your lil ones are playdough junkies, then they’ll love this. Why not make a pretzel in the shape of their favorite animal or superhero? Frankly B’s favorite part was shaping the pretzels; whereas CJ’s was tasting everything. Ahh yes, I’m proud to say he gets it from me. While you are letting the dough rise, throw a pumpkin, preferably kabocha or a butternut squash in the oven and let it cook. You can later use the baked pumpkin or squash to create a yummy soup. Want to try it out? Here’s my adaptation of the Pretzel bite recipe. Thank you Epicurious for getting me started on this! Add yeast to water. Make sure the water is the right temperature. Mix. Add the sugar. Let sit until yeast is activated. You’ll know when it is frothy and bubbly. If it doesn’t bubble, then toss it out and start over. Add the rest of the ingredients and mix. Then, four a work surface. Knead dough until elastic. This takes a few minutes. It’s great for little hands. But be forewarned that this is fun, yet messy process. Frankly I loved the impromptu visitor while I was in the middle of this. Coated in flour and sticky hands – yes, my kitchen and I (not to mention the boys) were in quite a state. I digress. After the dough is elastic, get out a bowl or a larger tubberware – lightly coat in in oil. I use Canola or Olive Oil. place dough in it, turn it over so it’s coated. Then cover with a kitchen towel. Let it rise until it is at least doubled in volume. While the dough is rising, bake your squash. You can bake it whole if you like, or cut it in half and take out the seeds. Either way works. It takes about an hour in an oven at 375 degrees. You’ll know it is done when the squash is soft. Once soft, then let sit and cool. Once it has risen, then (1) preheat the oven to 375 and (2) boil a pot of water with 1/2 cup of baking soda. If you are making just pretzels, no dogs, then go on to shaping the pretzels. If you are making pretzel dogs, then roll out the dough, and cut in pieces to cover the hot dogs. Wrap the hot dogs completely in the dough. Once all of your dogs are wrapped. Place them three at a time in the pot of boiling water. Let them cook there until they rise. Once they rise, gently remove them and place on a baking sheet coated with nonstick spray or parchment paper. Dust with salt if ya like. Repeat for the rest of your dogs. Once all of your dogs are on the baking sheet, then bake for 30 minutes or until the hot dogs reach at least 160 and the pretzel dough is golden brown. The dough browns towards the end of the baking process. While the dogs are baking, then make your soup. 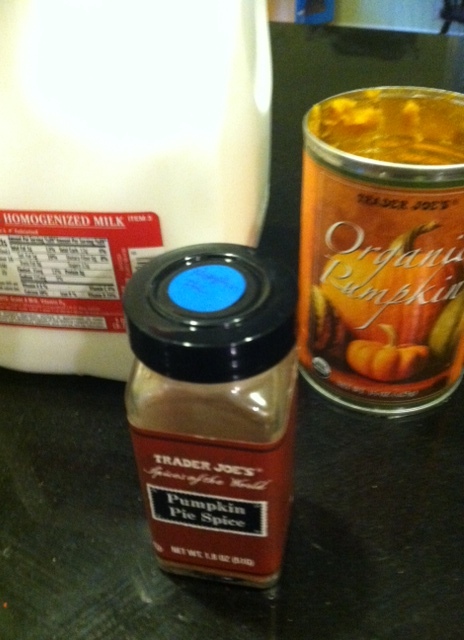 Scoop out the baked squash or pumpkin and put in a pot at a medium temp. Then add a can of light coconut milk. 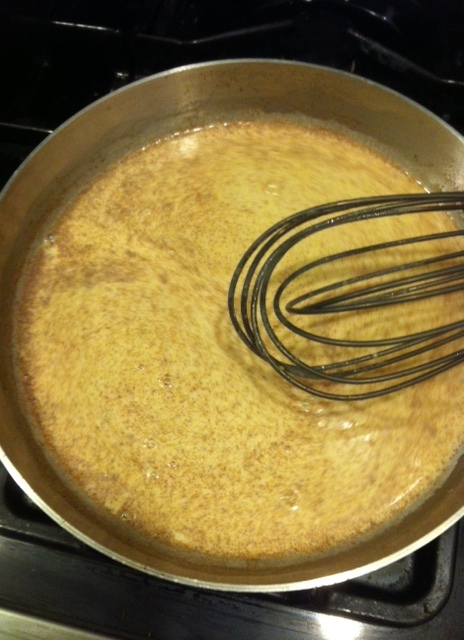 Mix with a whisk or an immersion blender. Cover and let it warm. Voila – soup! 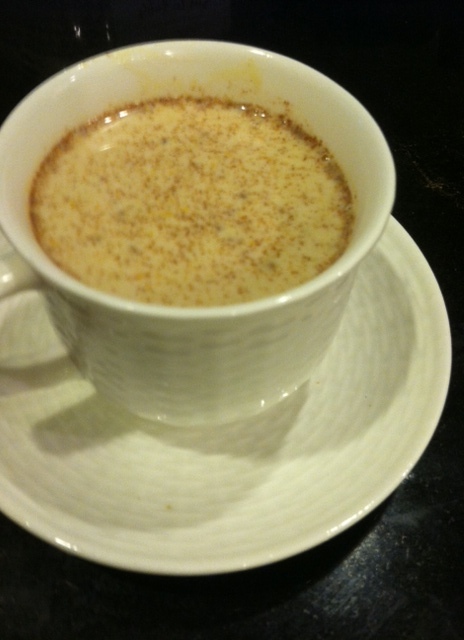 If it’s too thick for your taste then dilute with a bit of water, cream or milk. If you want to add more flavor, then consider curry as an fabulous option. 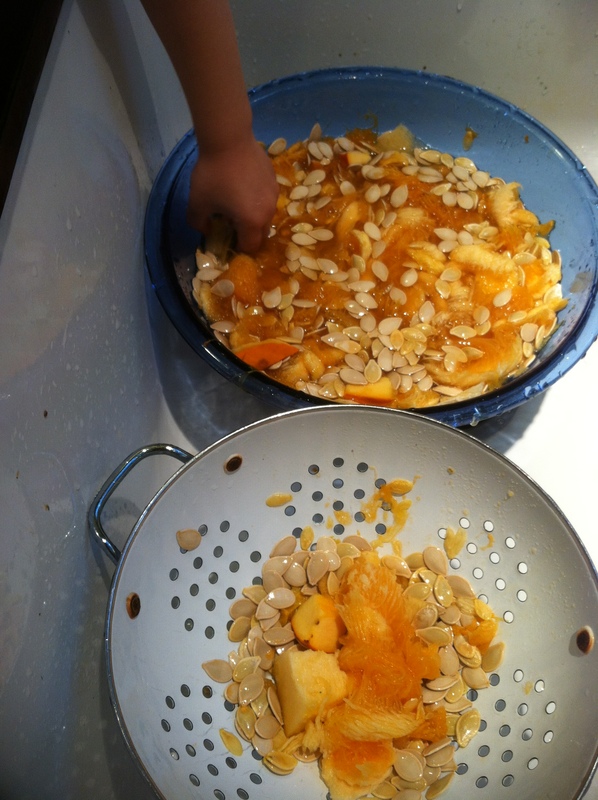 This entry was posted in eagle mom, food, recipe, sensory activities, Uncategorized and tagged cooking, cooking with kids, cultivating baby's tastes, Pumpkin, rainy day fun, recipe, toddler recipe on January 24, 2014 by Modern Mama. The boys and I have been busy spooking up our house. Determined not to spend money on anything but pumpkins, I decided to forge around the house to create decorations myself. 2$ later, I was ready to make my own signs to hang and place in the garden. 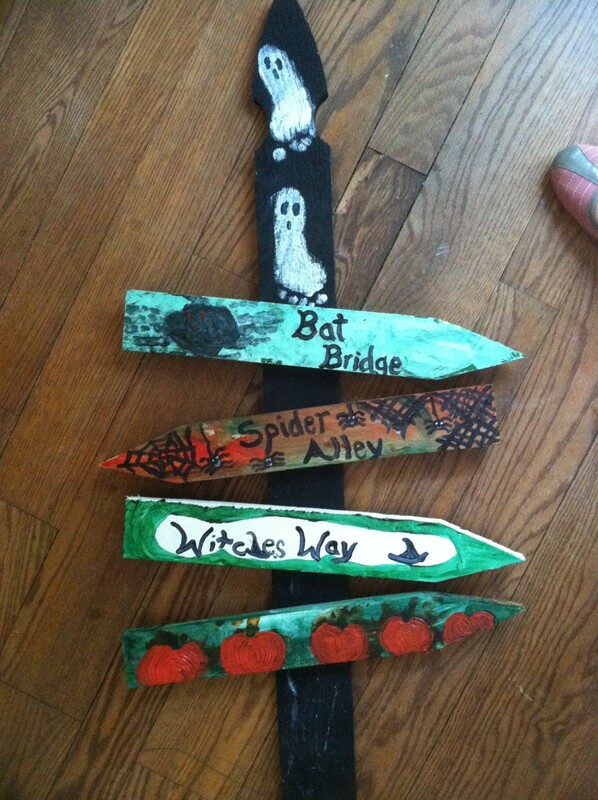 The boys and I painted the stakes, then decorated them. After putting on the final gloss and nailing them together, they were ready. Voila- a fun decoration that will grace our house for years to come. Want to do it yourself? All you need are a few supplies. You may even have some on hand. 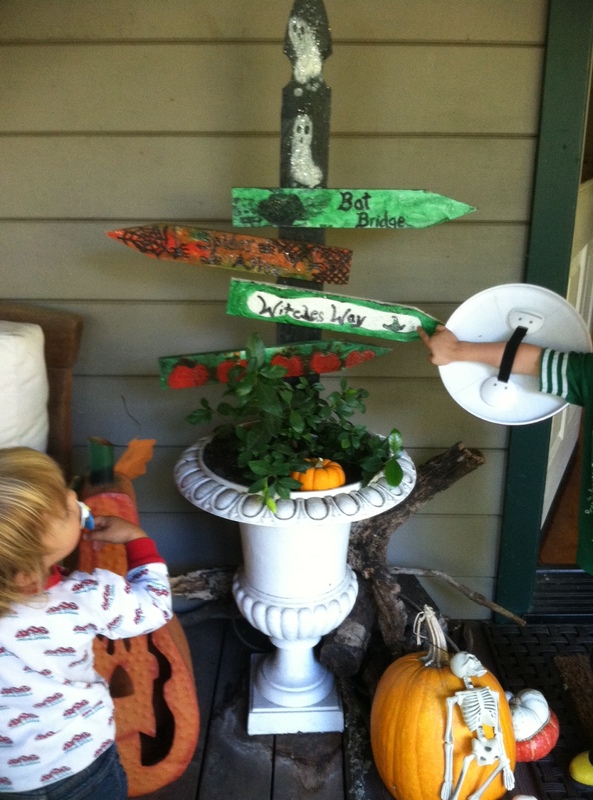 If you want to make the garden sign – then grab one piece if wood about 2-3 feet long and wooden stakes (as many as you like available at amazon), a few nails and paint, and a sealer. Hardware stores sell single fence pieces separately. Mine was 2$ which beat spending 19$ per sign from Pottery Barn Kids. If you want to make a hanging sign, just grab some eye screws that yo u would use for hanging a picture and a bit of twine. Super easy! By the way, don’t let a trip to the hardware store set you back. It’s pretty to find the wood section – just follow the scent of sawdust. Of course, in doing so be ready to see some Christmas goodies. Can’t we get through Halloween first? And what about Thanksgiving? Those turkeys need to be celebrated! After you are ready to go – break out your paint and go to town. I used tempera paint as it is what I have most of, but acrylic would work even better. Let your creativity guide ya! The possibilities are endless. Need inspiration? Do a quick Google search for images. Once you finish painting, let it dry. 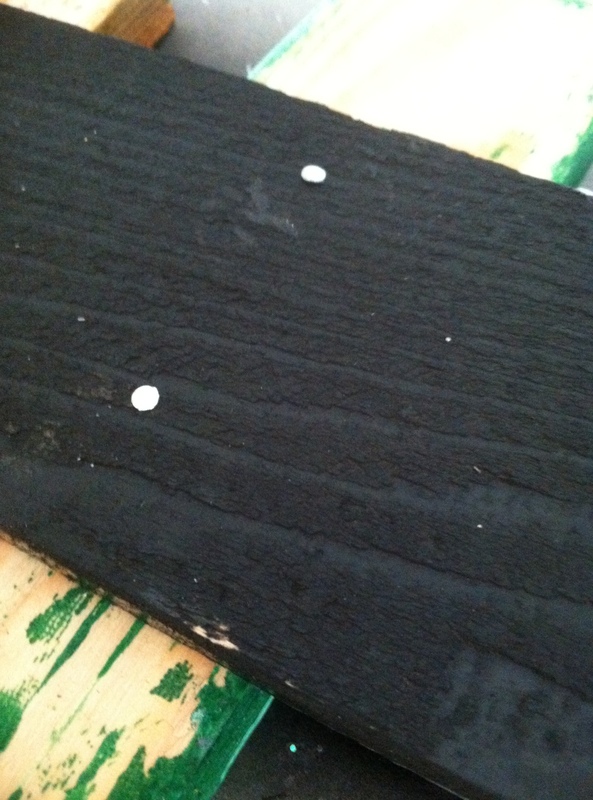 Once dry, then coat with a sealer. I used a gloss varnish as it was what I had on hand from making CJ’s solar system for his room, but there are spray sealers that will work too. Again, just grab it at the hardware store. At this point you can add glitter if ya like. My boys sprinkled it on everything. And, it made a cute accentuation of the pumpkin stems, which you may have guessed were made with their thumbprints. Let dry overnight. Then you’re ready to break out the tools. Grab your hammer and a couple of nails and seal the deal. Or let your little Bob the Builders have fun nailing it in. I must say that my late grandfather who was a talented carpenter and general contractor would have loved teaching the boys to drive in a nail. But alas, I got to have the pleasure. Then, get your goblins to help you pick a spot for your decorations! 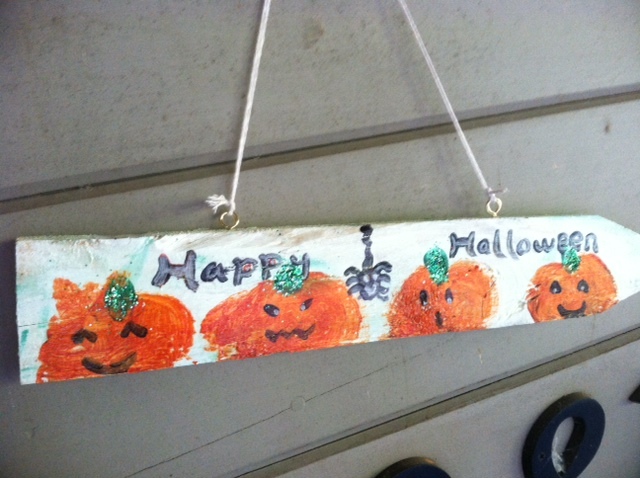 This entry was posted in celebrations, crafts, do it yourself crafts, Uncategorized and tagged Halloween, Hardware store, Paint, Pottery Barn, Pumpkin, Shopping, Tempera, Wood on October 18, 2013 by Modern Mama.